This is a wee tale about a journey from Robin Hood’s Bay to Whitby. The reference to the physicist ties in with the route – along one of the countless railway lines a certain Dr Richard Beeching identified for closure in the mid 1960s. The King is none other than the man that went through 6 wives and in trashed many an abbey in his argument with Rome. This journey ends at the abbey in Whitby. There is a second component to this tale – something that the purely rational amongst us may argue borders on the fanciful – the idea that a place may have an ‘other worldy’ feel about it. Well, I for one feel it is entirely reasonable it is possible to stray into an ancient memory that is held in the space around us. Such places can be a region – parts of the east Anglian coast or the islands of Mull and Orkney being an example. Ancient buildings can hold such a presence. Be they in a ruinous state or entire, it is their age that for me at least, means they may have a certain ‘capacity’ to hold an echo of past events. We were visiting the Yorkshire coast one October. 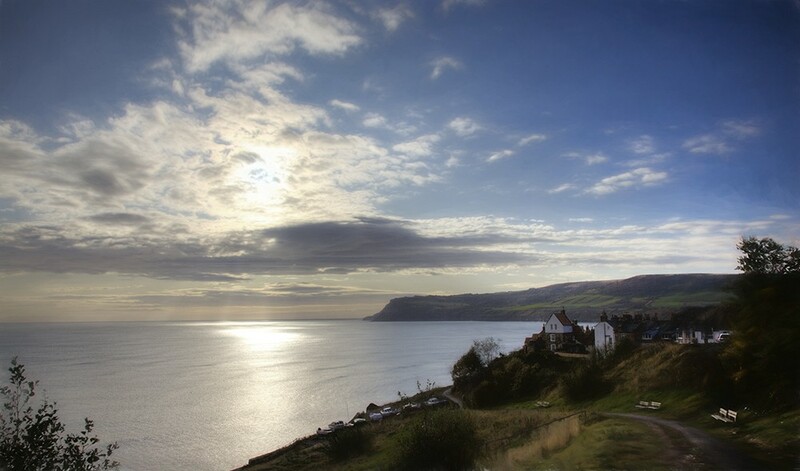 Our pad was a cold and dark self-catering cottage near Robin Hood’s Bay. One of the trips out, we cycled along the path of a disused railway that until 1965, used to run between Scarborough and Whitby. The first third of the run is a steady climb from where we joined the line at the Bay, to a high point and then a long gentle descent toward Whitby. Was there an atmosphere here? Yes, I think there was – particularly at stretches where the sweep of the north Yorkshire coast was clearly visible. I could ‘see’ steam trains running up and down the single track and was curious about how vital the line was during the war years. Also I wondered what it was like to on a train when there was heavy weather piling in from the North Sea..
A deceptively calm October day on the Yorkshire Coast. About half a mile out from Whitby the old line takes you over the Larpool Viaduct. It supported the the railway as it passed 120 feet over the River Esk. You can find out more about it here. From the viaduct, the town is about 5 minutes further pedalling. 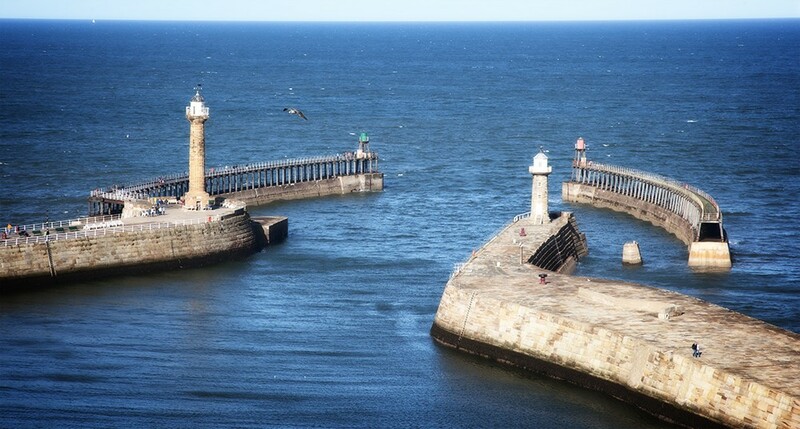 Whitby – A town with a harbour and more than its fair share of history. Also, a place where the River Esk divides the town into a ‘Kiss-me-Quick’ region on the western side and something very different when you cross the river to the east. From both sides of the river, you can walk onto the truly substantial wall that protects the harbour from the excesses of the north Sea. This, we did and looking back into the town, I could see why Bram Stoker had Whitby featuring as Dracula’s landing place in England! Crossing over the river via the old swing bridge to the east, the mood of the town changes. Narrow streets, medieval buildings and shops selling Jade and all things gothic. Following the road north, the walker is soon presented with a choice. Either continue at the lower level and pass under a cliff and in its considerable shadow, see the terraced homes and smokehouses for the fish landed at the quayside. The alternative is to ascend a steep, a VERY steep, set of worn steps to the terrace above – here, you will find the Abbey. There is a visitors centre – and a good one it is too, but my attention at least for a while, was the Abbey. The weather was variable with sunshine mixed with heavy downpours and this was perfect for demonstrating how the atmosphere of the place can change. The sun would break through the clouds and patches of light would move across the the stones of the ruin. Whitby Abbey…. 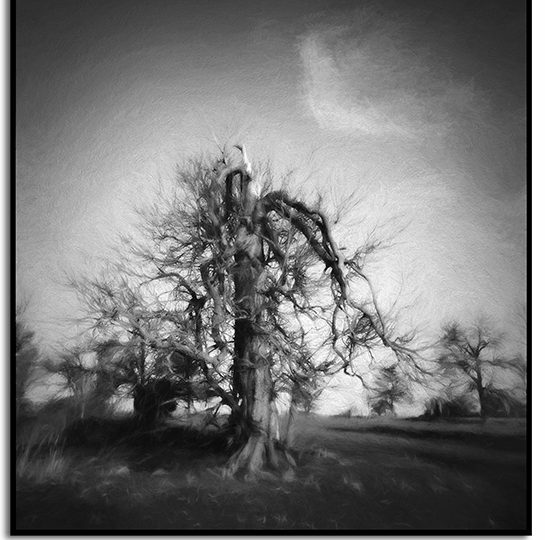 A very fitting place for all manner of strange happenings…. The first part of the ruin that captured my eye, was the circular window, high up on the northern transept. It must have been within centimetres of the roof.. The remainder of the ruin is equally fascinating. From the alternating shades of the stone to the massive pillars that once supported the roof. Some of the pillars are no taller than about 1.5 metres but this allows their diameter to be truly appreciated. Walking around to the northern aspect of the abbey, the North Sea is in view. Nothing stands between the abbey and the weather as it makes landfall. The walls of this place must have taken a battering in the centuries it has stood here. In its current state, it is a greater testament to the stonemasons that the walls still stand. A roof often adds to the structural strength of a building and without one, the ability to withstand winter storms has to be diminished. So far at least, roof or no roof, the ruin has strength enough to deny the weather from completing the destructive force brought to bear by a long-dead King. As to ‘atmosphere’, this place is LOADED with it. Oh, most may well be in the imagination but I count that a blessing. It enriches the experience of being amongst the pillars and walls of the place. The proximity of the sea adds more colour to what the mind experiences.